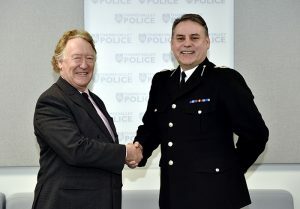 PCC Anthony Stansfeld (left) with John Campbell. The appointment is subject to a confirmation hearing by the Thames Valley Police and Crime Panel who will review the Police and Crime Commissioner’s proposed appointment on 1 February. John has 30 years police service and has worked in three police forces. He originally joined West Midlands Police in 1988, before transferring to Hampshire Constabulary in 2001 and joined Thames Valley Police in July 2010. He has held operational and command roles across a number of disciplines, including criminal investigation, specialist operations and local policing and worked as a hostage and crisis negotiator. John is an experienced operational commander and as Chief Officer in Thames Valley was responsible for the policing of the Olympic events, including the South East regional phase of the Torch Relay. He also led the multi-agency response to the Flooding in Oxfordshire and Berkshire in 2014. He has also commanded numerous firearms and public order events. In 2015 John received the Queens Police Medal, in the Queen’s Birthday’s Honours list for services to policing.